The Ryukyu Kingdom (Okinawan: 琉球國 Ruuchuu-kuku; Japanese: 琉球王国 Ryūkyū Ōkoku; Middle Chinese: Ljuw-gjuw kwok; historical English name: Lewchew, Luchu, and Loochoo) was an independent kingdom that ruled most of the Ryukyu Islands from the 15th to the 19th century. [note 1] The kings of Ryukyu unified Okinawa Island and extended the kingdom to the Amami Islands in modern-day Kagoshima Prefecture, and the Sakishima Islands near Taiwan. Despite its small size, the kingdom played a central role in the maritime trade networks of medieval East and Southeast Asia, especially the Malacca Sultanate. In the 14th century, small domains scattered on Okinawa Island were unified into three principalities: Hokuzan (北山, Northern Mountain), Chūzan (中山, Central Mountain), and Nanzan (南山, Southern Mountain). This was known as the Three Kingdoms, or Sanzan (三山, Three Mountains) period. Hokuzan, which constituted much of the northern half of the island, was the largest in terms of land area and military strength but was economically the weakest of the three. Nanzan constituted the southern portion of the island. Chūzan lay in the center of the island and was economically the strongest. Its political capital at Shuri, Nanzan was adjacent to the major port of Naha, and Kume-mura, the center of traditional Chinese education. These sites and Chūzan as a whole would continue to form the center of the Ryukyu Kingdom until its abolition. Many Chinese people moved to Ryukyu to serve the government or to engage in business during this period. 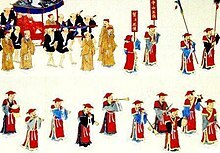 At the request of the Ryukyuan King, the Ming Chinese sent thirty-six Chinese families from Fujian to manage oceanic dealings in the kingdom in 1392, during the Hongwu emperor's reign. Many Ryukyuan officials were descended from these Chinese immigrants, being born in China or having Chinese grandfathers. They assisted the Ryukyuans in advancing their technology and diplomatic relations. On 30 January 1406, the Yongle Emperor expressed horror when the Ryukyuans castrated some of their own children to become eunuchs to serve in the Ming imperial palace. Emperor Yongle said that the boys who were castrated were innocent and did not deserve castration, and he returned them to Ryukyu, and instructed the kingdom not to send eunuchs again. According to statements by Qing imperial official Li Hongzhang in a meeting with Ulysses S. Grant, China had a special relationship with the island and the Ryukyu had paid tribute to China for hundreds of years, and the Chinese reserved certain trade rights for them in an amicable and beneficial relationship. These three principalities (tribal federations led by major chieftains) battled, and Chūzan emerged victorious. The Chūzan leaders were officially recognized by Ming dynasty China as the rightful kings over those of Nanzan and Hokuzan, thus lending great legitimacy to their claims. The ruler of Chūzan passed his throne to King Hashi; Hashi conquered Hokuzan in 1416 and Nanzan in 1429, uniting the island of Okinawa for the first time, and founded the first Shō Dynasty. Hashi received the surname "Shō" (Chinese: "Shang") 尚 from the Ming emperor in 1421, becoming known as Shō Hashi (Chinese: Shang Bazhi) 尚巴志. Shō Hashi adopted the Chinese hierarchical court system, built Shuri Castle and the town as his capital, and constructed Naha harbor. When in 1469 King Shō Toku, who was a grandson of Shō Hashi, died without a male heir, a palatine servant declared he was Toku's adopted son and gained Chinese investiture. This pretender, Shō En, began the Second Shō Dynasty. Ryukyu's golden age occurred during the reign of Shō Shin, the second king of that dynasty, who reigned from 1478 to 1526. The kingdom extended its authority over the southernmost islands in the Ryukyu archipelago by the end of the 15th century, and by 1571 the Amami Ōshima Islands, to the north near Kyūshū, were incorporated into the kingdom as well. While the kingdom's political system was adopted and the authority of Shuri recognized, in the Amami Ōshima Islands, the kingdom's authority over the Sakishima Islands to the south remained for centuries at the level of a tributary-suzerain relationship. For nearly two hundred years, the Ryukyu Kingdom would thrive as a key player in maritime trade with Southeast and East Asia. Central to the kingdom's maritime activities was the continuation of the tributary relationship with Ming dynasty China, begun by Chūzan in 1372,[note 2] and enjoyed by the three Okinawan kingdoms which followed it. China provided ships for Ryukyu's maritime trade activities, allowed a limited number of Ryukyuans to study at the Imperial Academy in Beijing, and formally recognized the authority of the King of Chūzan, allowing the kingdom to trade formally at Ming ports. Ryukyuan ships, often provided by China, traded at ports throughout the region, which included, among others, China, Đại Việt (Vietnam), Japan, Java, Korea, Luzon, Malacca, Pattani, Palembang, Siam, and Sumatra. Japanese products—silver, swords, fans, lacquerware, folding screens—and Chinese products—medicinal herbs, minted coins, glazed ceramics, brocades, textiles—were traded within the kingdom for Southeast Asian sappanwood, rhino horn, tin, sugar, iron, ambergris, Indian ivory, and Arabian frankincense. Altogether, 150 voyages between the kingdom and Southeast Asia on Ryukyuan ships were recorded in the Rekidai Hōan, an official record of diplomatic documents compiled by the kingdom, as having taken place between 1424 and the 1630s, with 61 of them bound for Siam, 10 for Malacca, 10 for Pattani, and 8 for Java, among others. The Chinese policy of haijin (海禁, "sea bans"), limiting trade with China to tributary states and those with formal authorization, along with the accompanying preferential treatment of the Ming Court towards Ryukyu, allowed the kingdom to flourish and prosper for roughly 150 years. In the late 16th century, however, the kingdom's commercial prosperity fell into decline. The rise of the wokou ("Japanese pirate") threat among other factors led to the gradual loss of Chinese preferential treatment; the kingdom also suffered from increased maritime competition from Portuguese traders. Around 1590, Toyotomi Hideyoshi asked the Ryukyu Kingdom to aid in his campaign to conquer Korea. If successful, Hideyoshi intended to then move against China. As the Ryukyu Kingdom was a tributary state of the Ming dynasty, the request was refused. The Tokugawa shogunate that emerged following Hideyoshi's fall authorized the Shimazu family—feudal lords of the Satsuma domain (present-day Kagoshima Prefecture)—to send an expeditionary force to conquer the Ryukyus. The subsequent invasion took place in 1609, but Satsuma still allowed the Ryukyu Kingdom to find itself in a period of "dual subordination" to Japan and China, wherein Ryukyuan tributary relations were maintained with both the Tokugawa shogunate and the Chinese court. Occupation occurred fairly quickly, with some fierce fighting, and King Shō Nei was taken prisoner to Kagoshima and later to Edo (modern-day Tokyo). When he was released two years later, the Ryukyu Kingdom regained a degree of autonomy; however, the Satsuma domain seized control over some territory of the Ryukyu Kingdom, notably the Amami-Ōshima island group, which was incorporated into the Satsuma domain and remains a part of Kagoshima prefecture, not Okinawa prefecture, to this day. The kingdom was described by Hayashi Shihei in Sangoku Tsūran Zusetsu, which was published in 1785. A early period Ryukyuan embassy in Edo, Japan. Ryukyuans wear the clothes which were near to the Chinese Hanfu. Traditional Ryukyuan clothes in late period, which were much more close to the Japanese Kimono. In 1655, tribute relations between Ryukyu and Qing dynasty (the dynasty that followed Ming in 1644) were formally approved by the shogunate. This was seen to be justified, in part, because of the desire to avoid giving Qing any reason for military action against Japan. Since Ming China prohibited trade with Japan, the Satsuma domain, with the blessing of the Tokugawa shogunate, used the trade relations of the kingdom to continue to maintain trade relations with China. Considering that Japan had previously severed ties with most European countries except the Dutch, such trade relations proved especially crucial to both the Tokugawa shogunate and Satsuma domain, which would use its power and influence, gained in this way, to help overthrow the shogunate in the 1860s. The Ryukyuan king was a vassal of the Satsuma daimyō, but his land was not considered as part of any han (fief): up until the formal annexation of the islands and abolition of the kingdom in 1879, the Ryukyus were not truly considered part of Japan, and the Ryukyuan people were not considered to be Japanese. Though technically under the control of Satsuma, Ryukyu was given a great degree of autonomy, to best serve the interests of the Satsuma daimyō and those of the shogunate, in trading with China. Ryukyu was a tributary state of China, and since Japan had no formal diplomatic relations with China, it was essential that China not realize that Ryukyu was controlled by Japan. Thus, Satsuma—and the shogunate—was obliged to be mostly hands-off in terms of not visibly or forcibly occupying Ryukyu or controlling the policies and laws there. The situation benefited all three parties involved—the Ryukyu royal government, the Satsuma daimyō, and the shogunate—to make Ryukyu seem as much a distinctive and foreign country as possible. Japanese were prohibited from visiting Ryukyu without shogunal permission, and the Ryukyuans were forbidden from adopting Japanese names, clothes, or customs. They were even forbidden from divulging their knowledge of the Japanese language during their trips to Edo; the Shimazu family, daimyōs of Satsuma, gained great prestige by putting on a show of parading the King, officials, and other people of Ryukyu to and through Edo. As the only han to have a king and an entire kingdom as vassals, Satsuma gained significantly from Ryukyu's exoticness, reinforcing that it was an entirely separate kingdom. Japan ordered tributary relations to end in 1875 after the tribute mission of 1874 was perceived as a show of submission to China. In 1872, Emperor Meiji unilaterally declared that the kingdom was then Ryukyu Domain. At the same time, the fiction of independence was maintained for diplomatic reasons until the Meiji Japanese government abolished the Ryukyu Kingdom when the islands were incorporated as Okinawa Prefecture on 27 March 1879. The Amami-Ōshima island group which had been integrated into Satsuma Domain became a part of Kagoshima Prefecture. The last king of Ryukyu was forced to relocate to Tokyo, and was given a compensating kazoku rank as Marquis Shō Tai. [page needed] His death in 1901 diminished the historic connections with the former kingdom. The Sho family now lives normally in Japan. Many royalists fled to China. 1187 – Shunten becomes King of Okinawa, based at Urasoe Castle. 1272 – Envoys from the Mongol Empire are expelled from Okinawa by King Eiso. 1276 – Mongols are violently driven off the island again. 1372 – The first Ming dynasty envoy visits Okinawa, which had been divided into three kingdoms during the Sanzan period. Formal tributary relations with the Chinese Empire begin. 1416 – Chūzan, led by Shō Hashi, occupies Nakijin Castle, capital of Hokuzan. 1429 – Chūzan occupies Nanzan Castle, capital of Nanzan, unifying Okinawa Island. Shō Hashi moves the capital to Shuri Castle (now part of modern-day Naha). 1458 – Amawari's rebellion against the Kingdom. 1466 – Kikai Island invaded by Ryukyu. 1470 – Shō En (Kanemaru) establishes the Second Shō Dynasty. 1477 – Shō Shin, whose rule is called the "Great Days of Chūzan", ascends to the throne. Golden age of the kingdom. 1500 – Sakishima Islands annexed by Ryukyu. 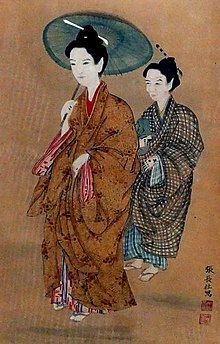 1609 – (April 5) Daimyō (Lord) of Satsuma in southern Kyūshū invades the kingdom. King Shō Nei is captured. 1611 – In accordance with the peace treaty, Satsuma annexes the Amami and Tokara Islands; Kings of Ryukyu become vassals to the Lords of Satsuma. 1623 – Completion of Omoro Sōshi. 1650 – Completion of Chūzan Seikan. 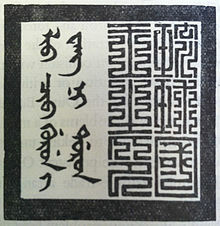 1724 – Completion of Chūzan Seifu. 1745 – Completion of Kyūyō. 1846 – Dr. Bernard Jean Bettelheim (d. 1870), a British Protestant missionary serving with the Loochoo Naval Mission, arrives in Ryukyu Kingdom. He establishes the first foreign hospital on the island at the Naminoue Gokoku-ji Temple. 1852 – Commodore Matthew C. Perry of the US Navy visits the kingdom and establishes a coaling station in Naha. 1854 – Perry returns to Okinawa to sign the Loochoo Compact with the Ryukyuan government; Bettelheim leaves with Perry. 1866 – The last official mission from the Qing Empire visits the kingdom. 1872 – Emperor Meiji unilaterally declares King Shō Tai as the "Domain Head of Ryukyu Domain". 1874 – The last tributary envoy to China is dispatched from Naha. / Kaiser Wilhelm I erects a "friendship monument" on Miyako Island. / Japan invades Taiwan on behalf of Ryukyu. 1879 – Japan abolishes Ryukyu Domain and declares the creation of Okinawa Prefecture, formally annexing the islands. Shō Tai is forced to abdicate, but is granted the rank of marquis (侯爵, kōshaku) within the Meiji peerage system. For a more comprehensive list, see List of monarchs of Ryukyu Islands and Genealogy of the Shō Dynasties. In the videogame Europa Universalis IV there is an achievement called The Three Mountains, which is achieved by conquering the world as the Ryukyu Kingdom. It is considered to be one of the hardest in-game achievements, thought to be an impossible one for a long time, due to Ryukyu's limited resources and isolation. 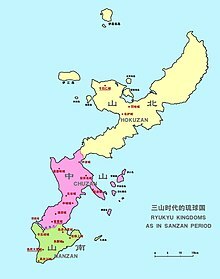 ^ Although the Ryukyuan king was a vassal of the Satsuma Domain, the Ryukyu Kingdom was not considered part of any Han due to trade relations with China. ^ Nanzan and Hokuzan also entered into tributary relationships with Ming China, in 1380 and 1383 respectively. ^ "Ryuukyuuan coins". Luke Roberts at the Department of History – University of California at Santa Barbara. 24 October 2003. Retrieved 1 June 2017. ^ Tsai, Shih-shan Henry (1996). The eunuchs in the Ming dynasty (illustrated ed.). SUNY Press. p. 145. ISBN 0-7914-2687-4. Retrieved 2011-02-04. ^ Schottenhammer, Angela (2007). Schottenhammer, Angela (ed.). The East Asian maritime world 1400–1800: its fabrics of power and dynamics of exchanges. Volume 4 of East Asian economic and socio-cultural studies: East Asian maritime history (illustrated ed.). Otto Harrassowitz. p. xiii. ISBN 3-447-05474-3. Retrieved 2011-02-04. ^ Deng, Gang (1999). Maritime sector, institutions, and sea power of premodern China. Contributions in economics and economic history. 212 (illustrated ed.). Greenwood. p. 125. ISBN 0-313-30712-1. Retrieved 2011-02-04. ^ Hendrickx, Katrien (2007). The Origins of Banana-fibre Cloth in the Ryukyus, Japan (illustrated ed.). Leuven University Press. p. 39. ISBN 90-5867-614-5. Retrieved 2011-01-11. ^ Grant, Ulysses Simpson (2008). Simon, John Y (ed.). The Papers. 29: October 1, 1878 – September 30, 1880 (illustrated ed.). SIU Press, Ulysses S. Grant Association. p. 165. ISBN 0-8093-2775-9. Retrieved 2011-01-11. ^ a b c d e Matsuda 2001, p. 16. ^ Murai 2008, pp. iv–v. ^ Okamoto 2008, p. 35. ^ Okinawa Prefectural reserve cultural assets center (2012). "東南アジアと琉球". Comprehensive Database of Archaeological Site Reports in Japan. Retrieved 2016-09-02. ^ a b Okamoto 2008, p. 36. ^ a b Sakamaki, Shunzō (1964). "Ryukyu and Southeast Asia". Journal of Asian Studies. 23 (3): 382–384. doi:10.2307/2050757. ^ Murai 2008, p. iv. ^ Okamoto 2008, p. 53. ^ Klaproth, Julius (1832), San kokf tsou ran to sets, ou Aperçu général des trois royaumes [San kokf tsou ran to sets, or General overview of the three kingdoms] (in French), pp. 169–180 . ^ Kang 2010, p. 81. ^ Kerr 1953, p. 366-367. ^ Matsuo, Kanenori Sakon (2005). The Secret Royal Martial Arts of Ryukyu, p. 40, at Google Books. ^ Kerr 1953, p. 175. ^ Lin, Man-houng. "The Ryukyus and Taiwan in the East Asian Seas: A Longue Durée Perspective", Asia-Pacific Journal: Japan Focus. October 27, 2006, translated and abridged from Academia Sinica Weekly, No. 1084. August 24, 2006. ^ Goodenough, Ward H. Book Review: "George H. Kerr. Okinawa: the History of an Island People...", The Annals of the American Academy of Political and Social Science, May 1959, Vol. 323, No. 1, p. 165. ^ Kerr 1953, p. 381. ^ a b Papinot, Jacques Edmond Joseph (2003), "Sho", Nobiliare du Japon [Nobility of Japan] (PDF@60) (in French), p. 56 . ^ Papinot, Jacques Edmond Joseph (1906), Dictionnaire d’histoire et de géographie du Japon [Dictionary of History & Geography of Japan] (in French) . ^ Kerr 1953, p. 236. Akamine, Mamoru (2016). The Ryukyu Kingdom: Cornerstone of East Asia. University of Hawaii. ISBN 0824855175. Kang, David C. (2010), East Asia Before the West: Five Centuries of Trade and Tribute, New York, NY: Columbia University Press, OCLC 562768984, ISBN 978-0-23115318-8; ISBN 978-0-23152674-6 . Kerr, George H. (1953), Ryukyu Kingdom and Province before 1945, Washington, DC: National Academy of Sciences, National Research Council, OCLC 5455582 . ——— (1958), Okinawa: the History of an Island People, Rutland, VT: Charles Tuttle Co, OCLC 722356 . Matsuda, Mitsugu (2001), 'The Government of the Kingdom of Ryukyu, 1609–1872 (dissertation submitted to the Graduate School of the University of Hawaii in partial fulfillment of the requirements for the degree of Doctor of Philosophy, January 1967), Gushikawa: Yui Pub., ISBN 4-946539-16-6 , 283 pp. Murai, Shōsuke (2008), "Introduction", Acta Asiatica, Tokyo: The Tōhō Gakkai (The Institute of Eastern Culture), 95 . Okamoto, Hiromichi (2008), "Foreign Policy and Maritime Trade in the Early Ming Period Focusing on the Ryukyu Kingdom", Acta Asiatica, 95 . Nussbaum, Louis-Frédéric (2002), Japan Encyclopedia, Cambridge, MA: Harvard University Press, ISBN 978-0-674-01753-5, OCLC 48943301 . Smits, Gregory (1999), Visions of Ryukyu: identity and ideology in early-modern thought and politics, Honolulu, HI: University of Hawaii Press, ISBN 0-8248-2037-1 , 213 pp. Brief History of the Uchinanchu (Okinawans), Uninanchu .